Locally sourced chocolate is great for your desserts and the environment — Mason’s & Co and Earth Loaf are two brands that make artisanal chocolate in India. Good quality dark chocolate is a thing of beauty: It smells luscious, tastes of the earth, and is the perfect way to recover from dementor-like moments. So when my friend Maegan Dobson Sippy rang me to share this happy news: “I have got a bar of Whittaker’s Chocolate. Let’s bake with it!”, I agreed in a blink. Given that this was the 72% Ghanaian dark chocolate sourced from Kuapo Kokoo, the first Fairtrade-certified smallholder farmer organisation in West Africa, we knew that we wanted to bake something where the chocolate would be the star. Sippy called up her father in the UK, and being the terrific baker that he is, he recommended a Claudia Roden recipe from her book The Food of Spain. Read the label of your favourite chocolate, look at its composition – is cocoa mass the main ingredient or is it jostling for space with emulsifiers, sugars, milk fats, and artificial flavours? Little wonder that good chocolate elevates your cakes and cookies, and your mood, to the next level. 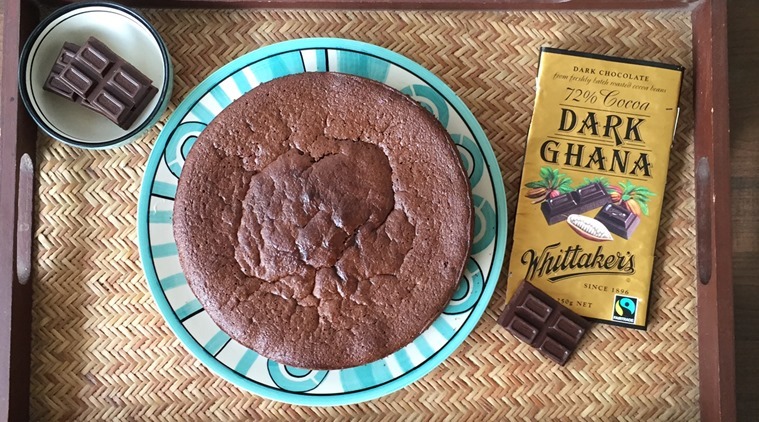 For most of my chocolate recipes, I am happy to use the cooking chocolate that’s locally available. But I have also used Mason & Co.’s artisanal chocolates from Pondicherry in baking and am quite happy with the result. Likewise, I find that Earth Loaf’s cocao nibs add a pleasing crunch to cookies and granola. And they’re both locally sourced, artisanal chocolate companies. Chocolate is becoming more precious. 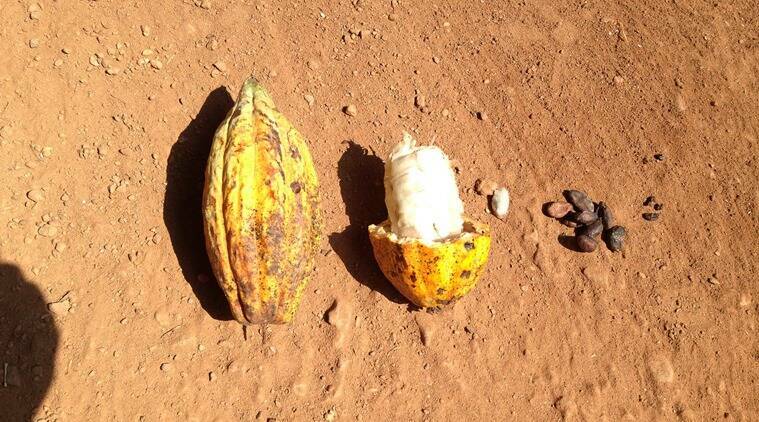 According to the Earth Security Group, Ghana and Côte d’Ivoire provide 60% of the world’s cocoa. As temperatures soar because of climate change, farmers are finding it harder to grow cacao in conditions that are too hot and arid. The Guardian reported that with little livelihood security, cacao farmers in Africa, for instance, are switching to other crops. And while we continue to love our chocolate bars, at the same time it is projected that the demand will soon be more than supply. We will reach peak chocolate in just four years. The author visited Joy VT’s cocoa farm near Kelakam in Kannur as part of Fair Trade Alliance Kerala. Pictured is a cocoa pod. You know a cocoa pod is mature when it turns yellow. The pods are harvested and split open and this is where your chocolate comes from. Some of the cacao producers of Kuapo Kokoo have adopted agroforestry systems to preserve soil fertility, instead of practising monoculture, the way most cacao beans are grown in Ghana. Of course, this is one climate adaptation method. But there’s so much more to do. As a consumer, if you’re buying chocolate, try and buy one that is special, made with fairly sourced ingredients that are grown in a way that’s ecologically and economically viable, and with a sustainable story behind it. And then savour it. Method *Preheat the oven to 160 C/ 320F. *Heat water in a pot and place another pan on top of it, without the bottom touching the water. Melt the chocolate with the water. Add butter. *Once the butter melts and you have a lovely shiny mixture, remove from heat. You can also do this in a microwave. *In a bowl, beat the egg yolks with sugar. Add ground almonds, baking powder, and rum and whisk until well-mixed. Add the chocolate mixture and beat until it becomes a smooth batter. *Using an electric whisk, beat the egg whites until stiff and fold gently into the chocolate batter. Bake for 35 minutes.